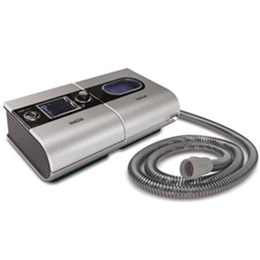 The VPAP™ Adapt is an adaptive servo-ventilator specifically designed to treat central sleep apnea (CSA) in all its forms while providing quiet and comfortable therapy. The VPAP Adapt algorithm adapts to the patient’s ventilation needs on a breath-by-breath basis, and is synchronized to the patient’s own recent breathing rate and flow pattern to maximize comfort and compliance. The H5i™ heated humidifier offers advanced humidification with Climate Control, which automatically maintains temperature and humidity levels as conditions change throughout the night (and from season to season). Our patented ClimateLine™ tubing delivers a constant, comfortable temperature at the mask and also helps substantially reduce rainout. Monitoring patient progress is convenient and easy with a range of data management options, including 30 sessions of detailed data, seven sessions of high resolution data, and 365 sessions of compliance and summary data. Compliance and summary data are easily transferred from the S9™ wireless module for daily remote monitoring and from the SD card on the VPAP Adapt. S9 wireless capabilities allow you to view patient usage during the critical first weeks of therapy, ensuring that any compliance issues are detected and addressed early. Understanding that every patient is different, S9 VPAP devices offer advanced technologies with maximum clinical control to help you meet the unique needs of even your most difficult bilevel patients. The VPAP Adapt algorithm adapts to the patient’s ventilation needs on a breath-by breath basis by automatically calculating a target ventilation (90% of the patient’s recent average ventilation) and adjusting the pressure support to achieve it. Because it’s synchronized to the patient’s own recent breathing pattern, the VPAP Adapt is able to provide a low, comfortable level of pressure support.